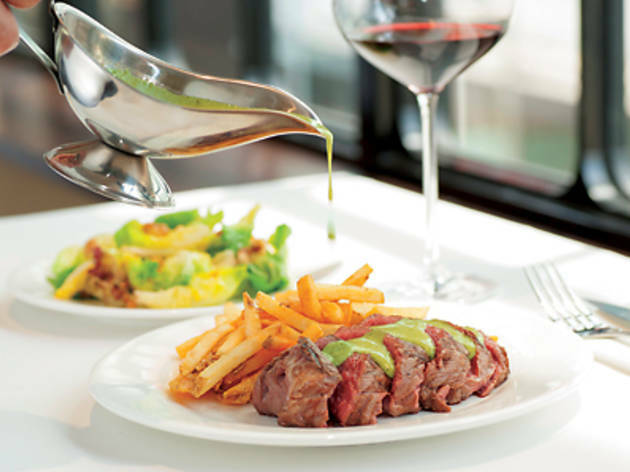 Steak frites could be the next culinary trend in our city. A year after Peel Street steak frites-only restaurant La Vache opened (and still has diners waiting for tables past 10pm on Saturdays…) comes L’Entrecôte de Paris, a French hotspot with more on its menu but still with the classic Gallic beef-and-chips dish as the star. If you’re from Paris, you’re excused for assuming that this new Wyndham Street restaurant is part of the famous L’Entrecôte chain of steak frites-only eateries owned by the Gineste de Saurs family. It’s not. But it does boast that its delicious secret sauce used in the beef dish is just as impressive as the famous de Saurs signature creation. The interior of L’Entrecôte de Paris is simple Parisian chic, with tiled floors, white tablecloths and nothing but glasses on the tables. And the menu is pretty limited. 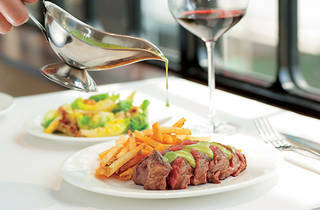 You can do the walnut salad starter, then steak frites ($268), or the salad, then grilled salmon and tagliolini ($268). We do both, and power past the salad, which is a generic mesclun mix with some balsamic vinegar and olive oil. The steak, though, looks grand, arriving already sliced, shiny and pink, and languishing in the ‘famous’ lime green sauce, which tastes phenomenal. It’s smooth and buttery, like a beurre blanc, and the aroma of the herbs tantalise the senses before quickly receding, letting you savour the chemistry it has with the juicy steak. However, the foodgasm is shortlived as the frites are totally unseasoned and dry. Shame. The salmon is even more disappointing – overcooked and stringy, the outer layer is like carpet and the sauce, which goes so well with beef does not work at all with fish and conversely highlights its blandness. And there’s barely any of it, so we can’t add it to the pasta and end up swallowing dry tagliolini. L’Entrecôte de Paris 3/F, 46-48 Wyndham St, Central, 3182 0105; lentrecotedeparis.hk. Dinner for two: $550.